Lentils are part of the legume family. And though small in size they are a nutritional powerhouse rich in protein and fiber, making them an ideal meat substitute. Lentils are wonderful to have on hand, they are quick and easy to prepare and work will mixed into soups, stews and even salads. Though I've eaten brown lentils often I have never until recently tried the red variety. The difference between the colors? In general, the brown lentils retain their shape well whereas the red tend to disintegrate. Red lentils also seem to have more of a subtle sweet nutty flavor. Working with Bob's Red Mill and Stonyfield Yogurt to create a protein packed recipe I came up with this satisfying salad that makes for a light yet filling lunch or dinner. One thing about this salad is that it tastes even better leftover, so I urge you to make extra! Combine the lentils and bay leaf. Place in a medium size pot and add 3 cups of water. Bring to a boil. Reduce heat to medium-low and cook until tender, about 15 minutes. Make sure to keep lentils covered with water during cooking; if water level is low, add additional water and reduce the cooking temperature. Drain the water and pull out the bay leaf. Add chopped olives and tomato halves and refrigerate until cold. While the lentils are chilling make the dressing. When ready, top with dressing and serve. Combine ingredients in a food processor. Blend until smooth, season with salt and pepper to taste. Serve over lentils. I love this recipe, including that delicious dressing! I love lentils. This salad sounds wonderful with the olives and tomatoes. I also love the feta and mint. How flavorful! This is so different than anything I have had. Sounds really good. Looks delicious! Love the dressing! Looks so yummy! I haven't made lentils in quite awhile. This is a great excuse! Pinning for later. Great recipe, love everything about this one. I'm with you on the red ones, nuttier flavour always works for me. Mmmm, what a delicious idea for a dressing! I'm so into Greek flavors, nice! Fancy and delicious. I love lentils, It's been far too long since I made any. Time to fix that. Yogurt Feta dressing sounds amazing!! I must admit, I have never tried this one before. What a gorgeous salad! Yum! This looks wonderful, and that dressing - YES!! Yes! I actually learned a new lentil recipe last night at my vegetarian cooking class! This looks wonderful! I absolutely love lentils! I usually have no less than 3 bags in my pantry at any given time. I just made lentil soup last night and cooked up a plain batch just to keep in the fridge to throw into salads, stirfrys, pastas, burritos, etc. Yum!! Lentils are so versatile. This looks great, only I'd go with tofu feta and non dairy yogurt. Thanks for the inspiration! I actually prefer red lentils over brown ones - the brown ones always seem to sit in my stomach like a stone. Love your salad recipe! I love lentils. Lentils and rice, lentils in soup, lentils and lentils! Everything about this sounds perfectly delicious! Lentils and olives together! Sounds like such a good combo! I've never had lentils that I recall. I love lentils. I use them in soups all the time. I eat a fairly good amount of lentils on a monthly basis! Red lentils are my favorite. Never had them in a salad though -- interesting idea! 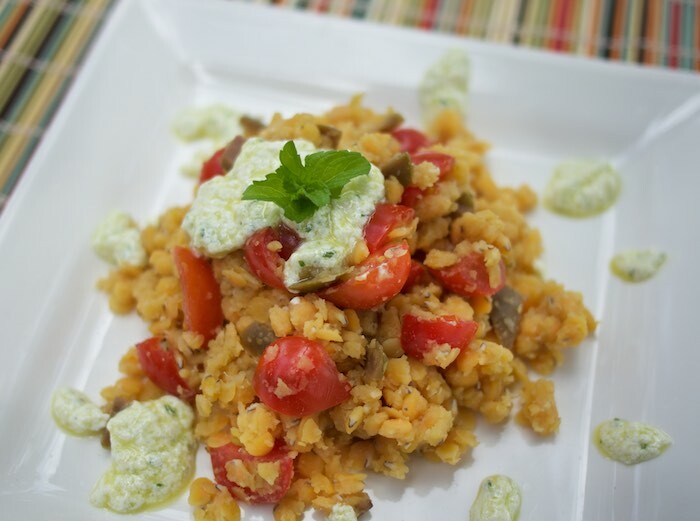 I love red lentils and olives so much, this sounds so amazing!! I love lentils! I love stuffing mushrooms and making sloppy joes with them! We love lentils, make them every week! My favorite lentil to prepare, it cooks so fast! Hi Theresa - Thanks for sharing this great recipe with the Let's Get Real party. This will be my featured post at this week's party.